This activity is a good starter for genetics units. Students are often fascinated by traits that are visible. Lively discussions of human genetics will often include students asking tons of questions about what they view as “oddities.” Though, many of those traits would be difficult to establish as strictly genetics, it provides a good starting point for learning what traits follow basic Mendelian patterns. 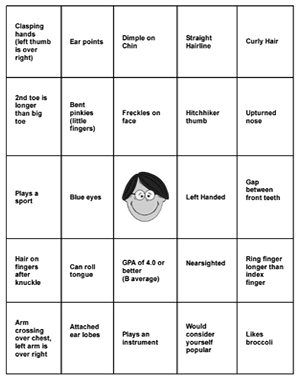 As you flip through a powerpoint describing some of these traits, students check them off on a bingo-style grid if they (or anyone in their group) displays the trait. Follow up with a discussion on traits that are inherited, like Darwin ear points, versus traits that are likely environmental or learned, like playing sports.